At Public School 73 in the South Bronx, 8-year-old Arlette Espallat is reading aloud in Spanish about animals found in “el bosque” or, the forest. Her voice rises as she brings the faraway images to the noisy classroom. Later in the week, Arlette and her classmates will read in English about the life of Olympic medalist Wilma Rudolph. But, ask the chatty third-grader which language she likes best and she gives a thoughtful answer. “I like Spanish better. That’s because I know if I learn my own language, then I will be better in reading and writing English,” she said. Several educators agree with Arlette’s reasoning. In New York City and other parts of the nation, dual-language schools and education programs are on the rise as a way to better prepare students for jobs in a globalized economy. The programs provide instruction in two languages in order to help students develop proficiency in both. In December, the New York City Education Department announced plans to create or expand 40 dual-language programs for elementary, middle and high school levels in Mandarin, French, Haitian Creole, Hebrew, Japanese, and Spanish. Schools Chancellor Carmen Fariña picked P.S. 73 and 14 other schools with existing dual-language programs to receive $10,000 for multilingual instructional materials and ongoing professional development for the 2015-16 school year. These “Model Dual Language Schools” will host visits from other school leaders and staff to share best practices and strengthen the programs. P.S. 73 principal Vivian Bueno said the model designation is a testament to the hard work of teachers and support of the parents who assisted in the recent expansion of the school’s Spanish dual-language program. But the 850-student school, which is located in one of New York City’s poorest neighborhoods, still faces challenges, including low standardized test scores; adapting the Common Core standards for the dual-language class; accommodating immigrant students who speak French and Bengali; helping students with few educational resources at home; and supporting dozens of students who live in homeless shelters. Across the U.S., the number of dual-language programs has soared from about 260 in 2000 to more than 2,000 in 2011, including more than 300 in the state of New York alone, according to the National Association for Bilingual Education. The rise stems from a need for more bilingual people in the workforce and some research that shows dual-language programs also benefit English-speaking students. A 2013 Michigan State University study found Texas elementary school English speakers who were enrolled in schools with bilingual education programs performed better on state math and reading tests than English-speaking students at schools without those programs. Those benefits have tempered the English-only movement of the late 1990s that led to controversial ballot initiatives in California and several other states. With more interest from middle and upper income parents who want their children to be bilingual, dual-language programs are poised for more growth. While dual-language programs all aim for proficiency in two languages, the programs vary depending on models selected by the teacher or school. Some programs teach in English one day and the second language the next day, while others alternate the language by subject. Unlike transitional bilingual education where teachers develop proficiency by gradually reducing the use of the native language, dual language advances reading, writing, and speaking in both languages. Despite the increase of dual-language programs for English learners, statewide assessments show that a wide achievement gap continues to persist with English language learners lagging behind their English-speaking peers, according to the New York State Education Department. In New York City, 30 percent of students achieved proficiency in last year’s ELA exam. In contrast, only 4 percent of English language learners in New York City passed the ELA exam. At P.S. 73, only 7 percent of all students reached proficiency in ELA, with just over 2 percent of English language learners at the school passing the exam. Reflecting on the scores, Principal Bueno remains undeterred and says they are seeing progress as the school expands and improves its dual-language program which now begins in preschool and runs to fifth grade. Under previous leadership at P.S. 73, the school only had a small French and Spanish dual-language program in kindergarten and first grade. The school’s growing population of Spanish-speaking students received transitional bilingual education or ESL class, placing additional burden on teachers and often resulting in insufficient attention to new immigrant students. 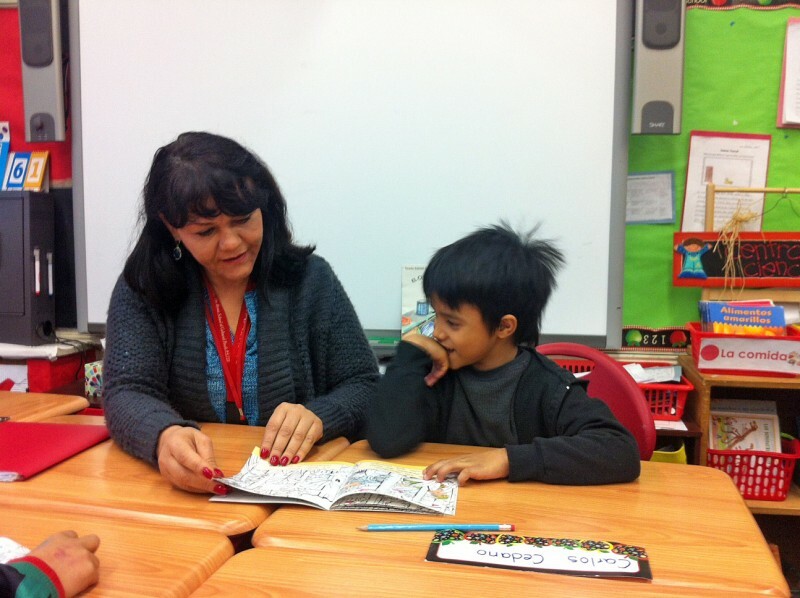 When Bueno arrived in 2012, she expanded the program by adding dual-language instruction in preschool and expanding it in kindergarten and first grades. Every year, she added a dual-language classroom to a new grade level, eventually extending from preschool up to fifth grade. Each grade level also retains traditional English-speaking classrooms. When asked how the school had adapted to the Common Core standards, Bueno said a big challenge has been finding materials to support dual-language instruction. However, she believes Common Core will help raise academic standards and bring educational equity to English language learners. “For me, this is a team effort. This is not about an English-only movement or Spanish-only movement. This is about, how are we preparing our students for college and careers?” she said. Even with the rise in popularity of dual-language programs, education experts say there is still not enough research to confirm that dual has an advantage over other bilingual programs. Even so, more parents of English speakers are enrolling their children in dual-language programs in hopes of giving them an edge on competition for jobs. Carol Joseph, whose three children attend P.S. 73 and speak English fluently, decided to place her 7-year-old daughter Samantha in the Spanish dual-language class. In the rough streets of the South Bronx where a littered cobblestone 119-step stairway provides the path to school, scores of black and Latino immigrant families struggle daily for food and shelter, but hold fast to the possibility of a better future for their children. Third-grade dual language teacher Frances Marte, who has taught at P.S. 73 for 20 years, said the economic hardship faced by students presents additional challenges in the classroom. In adapting her dual-language curriculum to the Common Core standards, Marte said she has made several adjustments including, separating the class into small reading groups to accommodate different levels, using more videos to assist reading comprehension and reading aloud more. Similar to teachers with English-speaking students Marte said she is incorporating more ELA texts that are related to the Common Core social studies standards. For example, the third-grade social studies standards require knowing the continents and ELA focuses on biographies. For that reason, Marte assigned her students a biography of Kenyan environmental activist Wangari Maathai, which is available in English and Spanish. “I knew that would be a good connection to what we’re studying in social studies. That’s how I go about doing things,” she said. Marte also tries to make literary selections that strike a cultural and socio-economic connection with her students. One book that proved popular with her third-graders was a biography of the Chilean poet Gabriela Mistral, who grew up in poverty and went on to win the Nobel Prize in Literature. Arlette already knows the importance of doing well in school. When asked if anyone helps her with assignments at home, she shakes her head in a silent “no.” If she gets stuck, she turns to her tablet to translate words from English to Spanish and vice versa. For her, the importance of a dual-language education is not solely related to succeeding in the U.S., it is also maintaining a connection to the family in her homeland. “I still have family in the Dominican Republic and I need to speak to them when I visit. That’s why I can’t forget Spanish,” she said.